All Subs available in 7" and 12" options. Wheat Roll available on request. *We recommend that you pick up your tray 30-45 minutes prior to serving for maximum freshness. If you must pick it up earlier than that, request your sandwiches dry with our secret sauce on the side! Great tasting cookie assortment to top off that party. Delicious double chocolate fudge, chocolate chip, oatmeal raisin, and peanut butter. Don't be fooled by others ... Our giant party subs are usually a "FULL" "6" wide for maximum feedability and come in sizes 3 & 4 feet. All giant party subs are custom made to fit your particular needs, because not everyone likes the same meats! Choose whatever you like - At no extra charge! If you would like two different taste combinations, you can have half of it turkey and cheese and the other half perhaps the "Big Dude", Italian combination. Vegetarian? No problem, we can do part of it avocado, cheese & marinated cucumber. Comes sliced and ready to go at no extra charge! We do individually bagged lunches for small projects, or multiple sandwiches packed 20 per case and nicely labelled for your easy distribution. Our stellar reputation for being a "get 'er done." makes us your first call for all your big projects. Contact Richard for a personal quote. 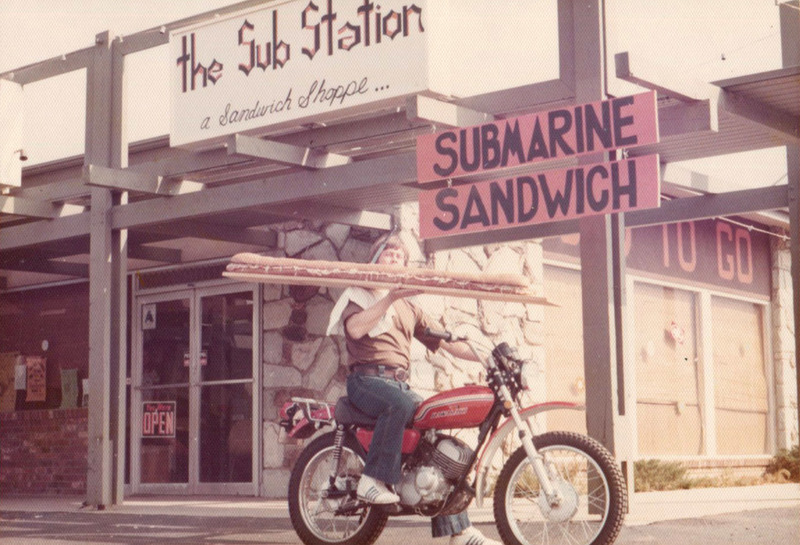 Located across from UC Riverside, The Sub Station has been serving up delicious sandwiches for students and Riverside residents since 1972. We seat over 100 people in a casual old school environment with an outdoor filtered patio. We serve great tasting "East Coast style" sub sandwiches,soups, salads and Bottled beer. Our sandwiches start with a fresh Italian roll filled with your choice of meats and cheese, garnished with shredded lettuce, fresh cut tomatoes, seasonings and our signature "Secret Sauce" dressing. We serve up Hot , Cold and Vegetarian sandwiches. Our Avocado and cheese with marinated cucumbers on the Wheat roll is one of our popular health conscious options. Other healthy options include our selection of salads. 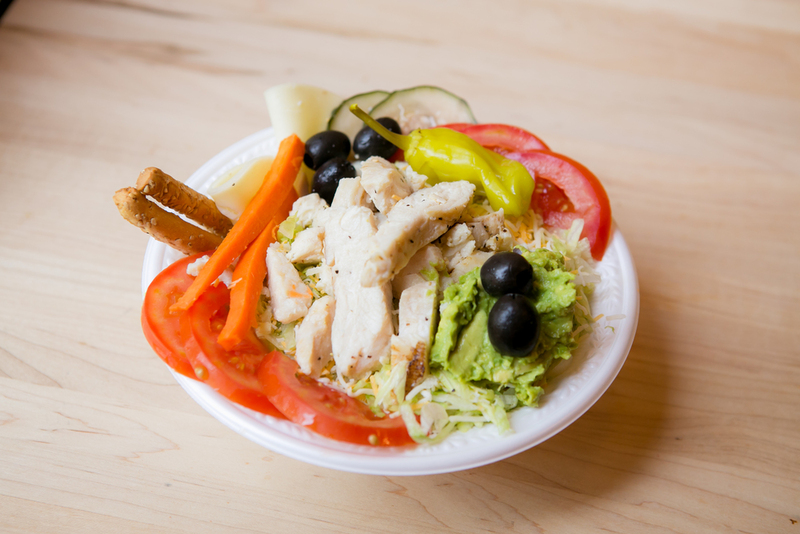 Try our Chicken Garden Salad w/ 7 vegetables, a pair of bread sticks and your choice of Ranch, Italian or Balsamic vinaigrette. Our "lean" pastrami comes from the eye of the round, a special cut w/ little or no fat, East Coast style, with mustard and a pickle or West coast with lots of veggies on it. 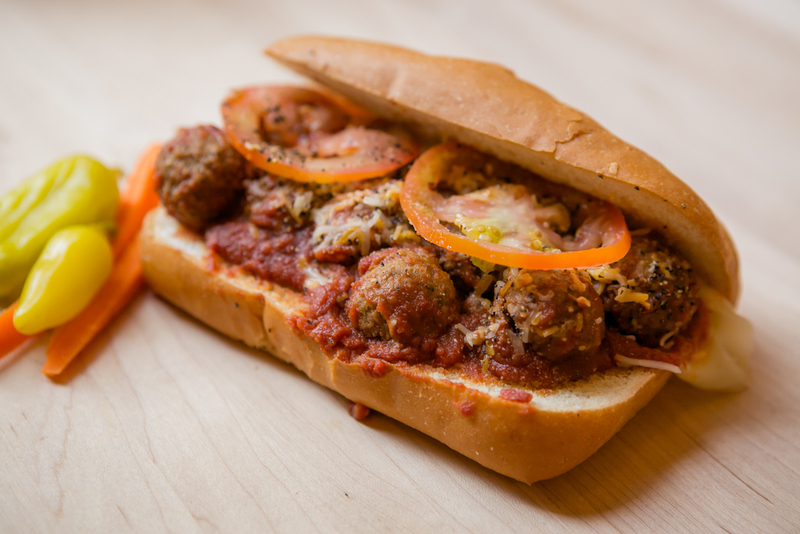 Our Meatball sub is in a rich red sauce, with 3 kinds of cheese, red ripe tomato slices, and served on the Italian roll. The Sub Station is one of the oldest eateries in the city of Riverside. Founded right here near UCR in 1972 we have a stout reputation for great food, fun and employees. Under the same ownership for 43 years our East coast style subs have remained the same for 4 decades, because of our uncompromising effort and passion for serving great food. Everything in the restaurant that you see and sit on is original. Every table and bench was built by hand by Richard and his Father. With a small budget Richard had to rely on all the carpentry experience he gained from his Dad growing up. Today his fathers passion for wood continues to live on through Richard. The Sub Station has always been about people. Our great employees and "you " our loyal old friends and soon to be "new friends". Come experience the Sub Station...its like coming home! Although Richard grew up a "Jersey Boy " he started college in Colorado and finished by graduating from Chico State up in Northern California. He was immediately drafted and spent 12 months in Vietnam. Upon returning home he grew a bodacious "afro"and shortly thereafter opened The Sub Station along with his college roommate who left the company a year later. Over the last 43 years The Sub Station has become a local favorite and one of the oldest eateries in Riverside. Meet our Subbers! We have been employing college students for over 43 years. The Sub Station is more than just a job. Being family run it has a sense of community. Teamwork, respect, and responsibility are values that pervade the experience of being a "Subber". The symbolic relationship between the owner, the valued customer, and the valued staff all work together for a common dining experience and sense of "pride" in your work. The Sub Station is not your average college job. When becoming a Subber you not only get to join our family atmosphere but you get to participate in fun adventures like trips to the lake, camping, employee dinners and many more. Beyond all the great events you will make everlasting friendships that last a life time. You may even meet your future husband or wife here. We have been known to produce more than a few weddings over the past 43 years! We are always looking for the next generation of Subbers to join our crew. If you are interested in becoming part of our fun team please email your resume to substationucr@gmail.com or come visit us and drop one off in person. We look forward to meeting you soon!